Whether you’ve been in the business for years or you’re just learning casually, understanding all the variations in salon shears can be overwhelming. 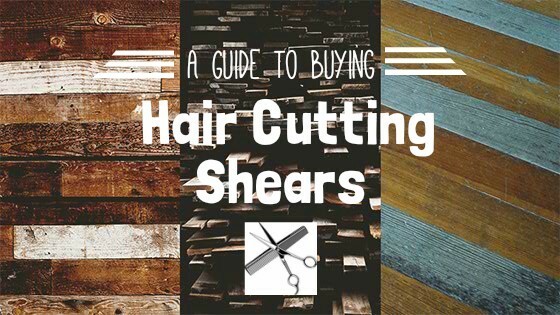 In this guide, we’ll break things down into easy chunks, starting with recommendations for hair cutting shears for home and beginners, professional hair cutting shears, and, finally, a buying guide. Equinox Pro Hair Cutting Scissors/Shears 6,5"
Pro Barber/Salon Razer Edge Shears 6,5"
Pro Barber Scissor Hair Cutting Set - 6,5"
ZZZZRT ZT-4444 Japanese J2 Stainless Steel Scissors - 5,5"
Unicorn Professional Left Handed Hair Cutting Set, 5.5"
#1. Equinox Professional Razor Edge Series - Barber Hair Cutting Scissors / Shears - 6,5"
These Equinox cutting shears are great for beginners on a tight budget. At these kinds of prices, the saying of, “you get what you pay for,” is something to keep in mind. But for beginners just looking for a good set to practice with, these shears are an excellent choice. For those just using them to cut hair at home, these will quickly pay for themselves in trips you don’t have to take to the barber. The blade edges are razor design, so they don’t cut as smoothly as a convex edge, but they are still much sharper than your generic beauty shop pair. The overall durability is good for the price and works well on all hair types. They are lightweight, though tend to be small, so are best for smaller hands. The tension should be checked before using, but generally holds well. The blades are wide and work well cutting thick hair or big sections at a time. Suvorna has an excellent reputation for providing professional hair shears at a reasonable price. Although this design is simple and it lacks some of the more advanced ergonomic features, it comes with a removable finger rest and an adjustable screw jointing with an external clicker plate that maintains the correct tension over long cutting sessions. The main trade-off is a more streamlined design in favor of making a high quality pair of shears at a price that will fit almost any budget. 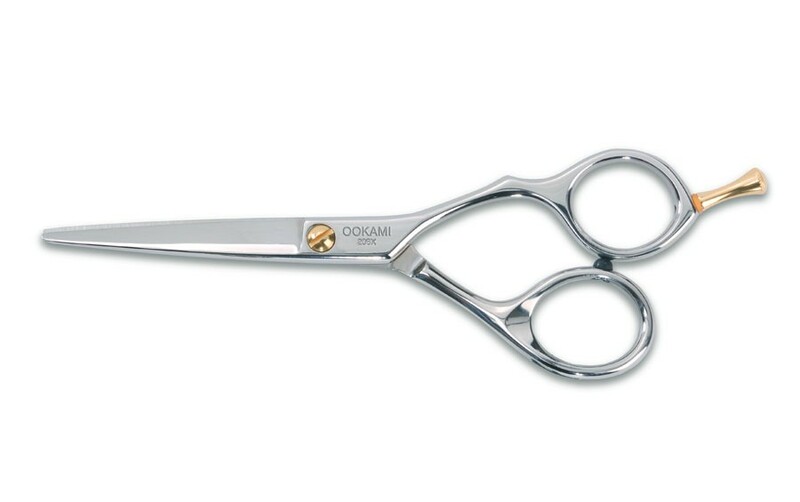 Made from Japanese J2 420 stainless steel and featuring a crane handle and convex edge, these 5.5 inch shears are made for smooth, precision cutting. Even for professionals with a packed schedule, you’ll find that these shears do not need to be sharpened more than once or twice a year, and with the convex edge, cutting will be sharp and quick. 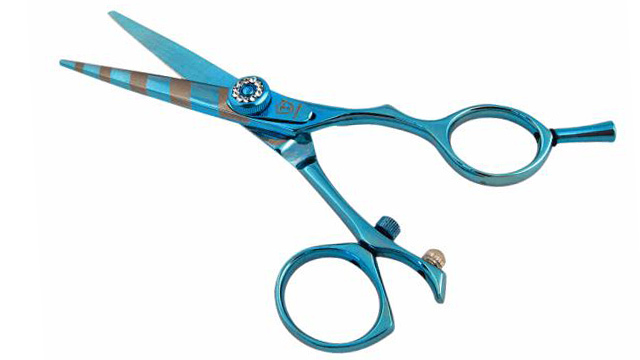 The Suvorna Razeco e25 is one of the most popular pair of shears that Suvorna sells, because it’s priced low enough that even beginners can splurge on a pair, and professionals will more than likely be purchasing back-ups. It comes in multiple colors and includes a lifetime warranty. These Purple Dragon hairdresser shears are equipped with a swivel thumb handle, making them ergonomic and joint-friendly for long hours of cutting. They take a little getting used to, so it’s best to practice with them for about a week before you bring them into the professional setting, but the swivel thumb grip will keep your joints in a more natural position to prevent repetitive strain injuries. 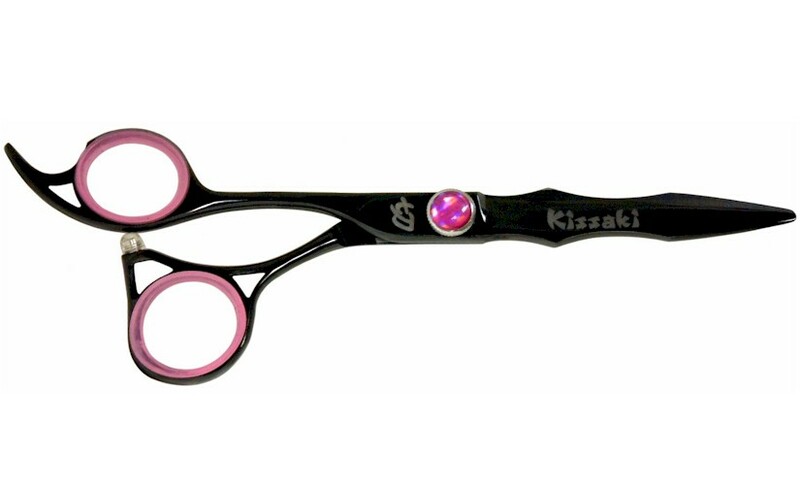 As far as cutting, the Purple Dragon shears are made from 440C Japanese stainless steel with a liquid silver finish. These also feature a convex edge that will give you the smoother, sharper cuts. It has a liquid silver finish, which looks nice, but doesn’t add much to functionality. The tension system is a direct adjustment knob with a heart on it. It holds well, but it can be a little difficult to grip the screw. #4. 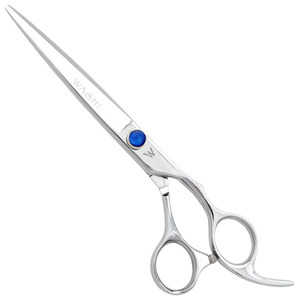 Mosher Salon Tools Professional Handmade Shears, 6"
The main feature of this Mosher 440C stainless steel shear set is the intricate and very detailed engraving of the handles. The handles are grooved crane design with a ball bearing tension system. For the quality of steel and attention to detail on these tools, the price is also very reasonable. The set includes one pair of convex-edged shears and a 32-tooth texturizer. 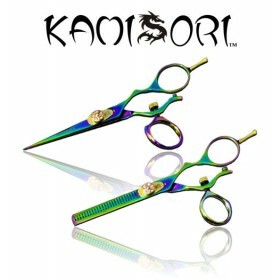 Both are suitable for dry as well as wet cutting and designed for basic to mid-level stylists. The Shark Fin set comes with three tools: a pair of shears, thinner and razor. The tools in this set are made of VG-10 Hitachi Japanese steel. They include the shears, thinner and razor, along with a case, finger fitting system, polishing cloth and lubricating oil pen. The grips on these tools feature Shark Fin’s patented grooved handle, which makes for easy gripping in different cutting methods. The shears also have a swivel thumb grip and all of the tools are designed with a crane handle. #6. Professional Barber / Salon Razer Edge Hair Cutting Scissors / Shears - 6,5"
These are another ergonomic pair of cutting shears at a low price. These have a convex edge, which cuts cleaner and smoother, and allows you to more easily practice advanced techniques like slide cutting. The tension system is a leaf spring system with a fine adjustment knob, giving the blades on these shears more stability than other designs in this price range. The downside is that, like the Equinox shears, the durability on these are not the best. They get dull easily and are not as sharp as the Equinox. They don’t work as well cutting thick sections of hair – they tend to bunch and slip. They’re better used cutting fine hair or cutting in thinner sections. #7. ​Unicorn Plus Professional Left Handed Hair Cutting Set, 5.5"
This Unicorn Plus kit includes a full range of tools – shears, thinners and razor. It is designed specifically for left-handed students, so it’s less expensive than, for example, professional Komisori tools, but more expensive than what a casual kit for beginners. These are probably more appropriate for someone who is in active training to become a professional stylist. The set includes a pair of shears, thinners and a razor, along with a leather storage case. The handles are offset and the shears have 3D convex blades with a ball-bearing tension system, making it easy to practice all cutting techniques. The thinners cut at a 25% texturizing percentage. All the tools are made of 420 Japanese steel and this set also has a right-handed order option. Overall, this is a very good quality beginner set at a reasonable price. #8. Professional Barber Scissor Hair Cutting Set - 6,5"
An affordable stainless steel set, this kit includes shears, thinner and razor in a faux leather case. The handles are offset style, with grooving on the texturizer, and the blades are razor edge. They’re not as comfortable to hold for long periods of time, but for an hour or two at a time, they’re not bad. They don’t cut as smoothly as some of the other beginner options, but for the price, they do cut well. They work on both thick and thin hair. The durability is a little better than the Equinox shears, and they retain a sharp edge much longer than generic brands. Although there’s nothing particularly special about them, the quality is good enough that, when they get dull, they’re worth sharpening rather straight out replacing. These Japanese steel, titanium-coated hair shears are especially good for anyone looking for rust-resistant tools, or if you happen to be allergic to nickel. Plus, the colors are really fun. 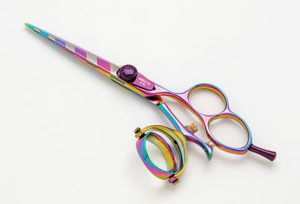 The set includes shears, razor and thinner, all titanium-coated in a rainbow hue. The handles are grooved crane with finger rests and are comfortable to hold even if you’re working with them all day long. Although reasonably priced, the cost is mainly in the titanium. These do wear down very quickly and the tension screw sometimes comes loose. These are good for a low maintenance set to keep at home, or to use in a pinch at the salon. However, the balance on the shears seems a bit off and the blades need regular sharpening. If you’ve never used barber shears before, it’s best to start with a cheaper pair of basic hair scissors while you learn different techniques. These shouldn’t cost you more than $15 or $20. Later on, if you plan to move into the field professionally or just think you’ll be using these techniques often, you can invest in better quality shears, keeping in mind that these will cost $100 or more. The best size to start with, unless you have very small or large hands, is a 5.5 inch. This is industry standard and what is used to teach students in salon schools. You can use any type of haircutting shears at home, but what you use depends on your situation. Since better quality shears will cost a lot more, it might be more practical to get a cheaper pair. You can still get the different types and handle designs in a lower grade material without digging too deep into your wallet. We’ll discuss this more in detail below. To help you figure out the specifics of what you might be looking for as far as professional shears for hair cutting, we'll go through the different aspects of shears to help you understand the various parts, types and uses. The basic make-up of hair shears is similar to a regular pair of household scissors. There’s a pair of blades on a joint connected to a handle with two shanks and rings. Here’s a diagram to give you a visual and detailed terminology. Take a quick look, as we’ll be using some of these terms throughout the rest of the guide. 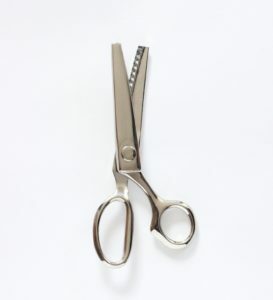 The main difference between salon scissors and shears is the length, shears being over 6.5 inches long and scissors being shorter, although these terms are often used interchangeably. Texturizer: Texture shears have teeth on one of the blades, like a comb. These are used to give a cut different effects. Thinning Shears: Similar to texturizing shears, but the gaps in the teeth tend to be thinner. These are used to thin hair or blend layers. The more teeth are on the blade, the less hair is removed. 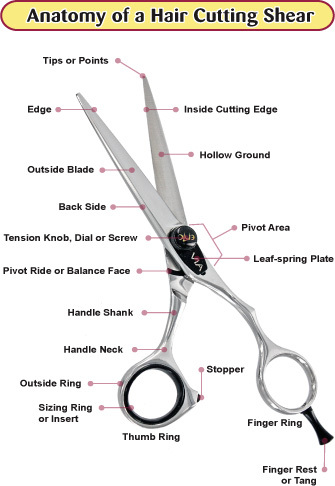 Top of the Line Hair Cutting Shears: High quality shears are made of a harder and higher quality steel. They cut smoother, quieter and last longer, although they are more expensive than lower quality shears. Shears for Cutting Dry Hair: If you can afford it, you’ll want a harder steel shear, since dry hair is a little more abrasive than wet. Generally, heavier blades work better on dry hair and thinner blades on wet. For dry hair, the blade should be thicker in the middle of the blade before tapering down. You’ll also want your dry cutting blade to be a bit broken in – if you use it right after it’s been sharpened, you might end up “skinning” the hair if it catches the cuticles. Pinking Shears for Cutting Hair: These have blades with zig-zagged teeth, like a saw, and are used to get a jagged edge on a cut. Hair Cutting Razor Shears: One edge is straight and the other is serrated, to help grab the hair and prevent slipping. 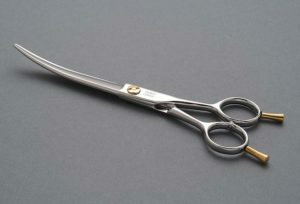 Double Swivel Hair Cutting Shears: These shears have two swivel joints on the thumb ring to minimize the movement of the thumb. These are designed for stylists who have Carpal Tunnel or other joint issues. Curved Hair Cutting Shears: The blades have a curve, which helps in getting precise, straight and consistent cuts along the entire length of the blade. Black Hair Cutting Shears: A black, blue or rainbow coloring indicates a titanium coating, which makes them chemical resistant and rust-proof. Also good for stylists who are allergic to nickel, as the titanium coating prevents contact with the stainless steel inside, which contains nickel. Used mainly by stylists who cut with middle finger and thumb, this grip forces an elbow-up position when cutting. Allows more movement and reduces over-extension of the thumb, but still pushes the elbow up while cutting. Allows the elbow to drop and relieves stress on the joints, especially good for stylists who use the palm-to-palm cutting technique. Allows the wrist to flatten, parallel to the blades, and minimizes thumb movement, giving the most ergonomic cutting position. Swivel shears are especially good for those with wrist problems. Allows for better grasp when using Eastern or Western grips. The advancement of modern designs, like the crane grip, has helped to reduce the frequency of repetitive strain injuries by putting your joints into a more relaxed position while cutting. If you plan to be working on hair for several hours or more in a day, an ergonomic handle design, such as swivel thumb shears, is highly recommended. 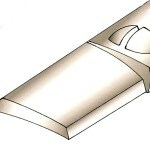 Beveled Edge: Also known as “razor edge,” this is an old design that has two planes on the edge of the blade. The cost of these hair shears usually runs cheaper, since this is easier to make, but it requires more force when cutting and can’t be used for advanced techniques. Convex Edge: The modern and highest quality design, the edge has a sharp curve which makes cutting much smoother and quieter. 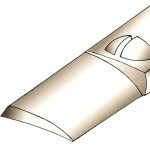 This type of blade edge is also necessary for techniques like slide cutting. ​Most stylists prefer a CONVEX (Hamaguri or Clamshell) edge. However, if the steel in your shear is of superior quality and the blade was designed originally with a beveled edge, that is the edge it should always have. The tension system refers to the amount of tension at the joint between the handle and blade. The tension should be balanced for cutting – not too loose that it doesn’t cut well, and not too tight that force is required to open and close the blades. Adjustment Screw: Pivots on a screw with a groove on top, can be adjusted using a coin or screwdriver. Direct Adjustment Knob: Textured dial that can be adjusted with fingers. Leaf Spring Tension System: A leaf spring is added below the dial to spread tension across the pivot area. This can help the blade edges last longer, because it stabilizes the blades to cause a more balanced wear pattern. Reversible Leaf Spring System: The knob and screw can be dismantled and reassembled on the opposite side to make more comfortable for left-handed stylists. Ball Bearing Leaf Spring System: Addition of ball bearings can increase stability of the blades. The blades rotate on a ball bearing instead of a standard washer. Flat Bearing Tension System: For stylists who prefer a more streamlined shear, the ball bearings are internal, between the joint blades. There are generally two ways to go about choosing the length of your shears. The best choice will likely take both into consideration. The first is choosing your shears by hand size. The traditional method to find the correct size is to first curl your fingers into your palm. Take note of the spot where they touch. Then hold the scissors against your hand with the edge of the thumb hole on that spot and the blades lined up against your middle finger. The tip of the shears should be within half an inch of the end of your finger. This gives you a general idea of what size shear best fits you. Cutting with shears that are too big or too small over a long period of time will not only be uncomfortable, but can hinder your technique. Tying in from that, the second way to choose the size of your shears is by technique. Industry standard is 5.5 inches, and this length is now usually used to teach students in salon schools. Going shorter or longer than that may now depend on which technique you want to use. Precision point cutting, for example, should use a shorter blade. Cutting scissor over comb or making other long cuts would be better done using a longer blade. However, there is no hard and fast rule here. Knowing what length is best for which technique takes practice and experience, and will be different for different stylists. And as a final note on sizes, the fingers rings should also fit your hand to avoid developing joint problems like Carpal Tunnel. If you slide your ring finger into the finger ring, the handle should not go past your second knuckle. Putting your thumb into the thumb ring shouldn’t go much past the tip. 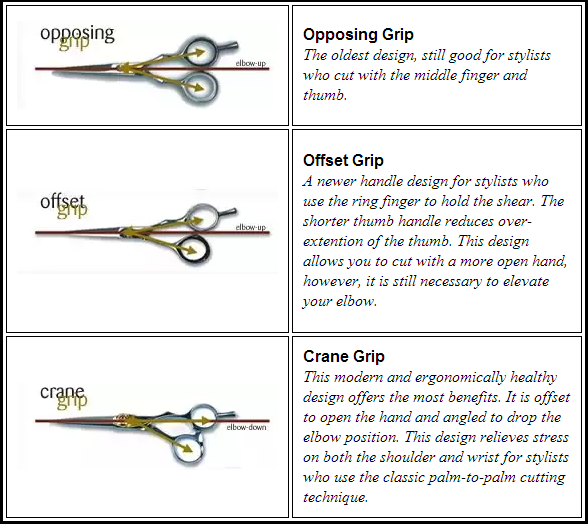 When holding the shears, your ring finger and thumb should be parallel to each other, and you should have a good enough grip to have full control without forcing your hand into uncomfortable positions. All professional shears are made of steel. Germany and Japan make the best steel, with Hitachi Japanese steel being the absolute best. German steel shears are made by melting stainless steel into a basic mold. They are cheaper and less smooth than Japanese, and they also have bevel-edged blades rather than a convex edge. Japanese steel uses higher quality alloys and produces a smoother, quieter blade. Steel quality is measured by a heating grade and a hardness (Rockwell Hardness or HRC) rating. High quality steel, like that produced in Germany and Japan, rate at a 440 heating grade and 59-63 HRC. A higher grade steel will be 440 with v-steel or cobalt added in, and the highest quality steel out there is made at the steel company, Hitachi, which is the highest rated in the world. The greatest quality (and price) steel from Japan. Hitachi compony makes steel not only for scissors, but for knives and Yakuza swords. Country of origin: Japan or Germany. Great quality steel in three levels: A, B or C. C is the best. Scissors should last you for years, if you take care of them. Country of origin: China, India, Korea or Pakistan. Steel is very soft and it chips very easily. Low quality steel, rated at 330 heating grade and 53-54 HRC, is what comes out of China, India, Pakistan and Korea. Although cheaper by comparison, they are also much softer and chip much more easily. A Hitachi blade should only need to be sharpened once or twice a year, if taken care of. However, a 330 Chinese steel blade would need to be sharpened every couple weeks and would become useless after 4-6 sharpenings, when it has deteriorated to the extent that an edge can no longer be found. If you are planning to use your shears often and for long periods of time, it is well worth the expense to invest in shears made with a high quality steel. Depending on your circumstances, it may be beneficial to buy multiple pairs of professional shears. One reason to buy two pairs of the same shear type is so that you can always have one to work with when you need to send the other in to get sharpened. 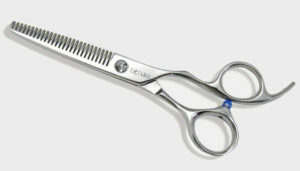 You may also want a variety of shear types and sizes, in order to have more tool options when using different techniques while styling. Most professional stylists carry two full sets of hairdresser shears. When shopping for salon shears online or at show booths, it’s often easy to get caught in a scam unless you know what to look out for. Here’s a list of tips to keep in mind as you search for a good set of shears. Know what you’re looking for. Do you have a tight budget and want the best you can get inside that budget? Are you looking specifically for Hitachi steel? Do you want a specific handle or blade design? Write down exactly what you want ahead of time, so that when you go online or to a salon show, you won’t get overwhelmed by the options and you’ll be less vulnerable to scammers. Know your prices. A good pair of shears ranges from $100-$500. A titanium coated shear will cost around $400-$500. Higher grade steel will push the price above $500. Taking all that into consideration, you should never spend upwards of $1,000 or more on a single pair of shears. Even for a good pair of shears, at that price, the vendor is most likely trying to scam you. Only buy from reputable brands. If you’re not familiar with the brand, ask the vendor what country the steel came from and what its heating grade is. The answers should be Germany or (preferably) Japan, and 440 A, B, or C steel. V-Steel, Cobalt and Hitachi are all upgrades to the base steel, so those are good answers as well. 330 or below is poor quality steel and should be avoided. If you’re buying at a show, avoid booths that have their shears laid out on the table. They should be kept in display cases. Companies that aren’t afraid of having their scissors stolen or damaged probably aren’t selling anything worthwhile. Make sure they’re selling a size that fits your hand. If they aren’t, you don’t need to waste time at that booth. You should try to get the best quality and most ergonomic design you can afford. That’s with the full offset crane handle, swivel thumb and stationary tang. This grip will save you a lot of pain over long hours of hair cutting. Other good questions to ask vendors are: Do they offer a warranty? (They should.) How long have they been in business? (The longer the better.) And any questions relevant to your specific situation. Other than that, the old adage of: “If it sounds too good to be true, it usually is,” is always a good one to keep in mind while shopping. Once you’ve spent a significant chunk of money on a quality set of shears, it’s going to be a priority to care for them properly so that they stay in good form for as long as possible. The first thing to remember is when you set down your scissors during a cut, never leave the blades open or lay them down on a hard counter. Always close the blades and rest them on a towel or other soft surface. This will decrease the chance of the blade getting nicks or chips, which will require sharpening to get rid of. The less you have to sharpen your blades, the longer the shears will last. If the blades are not cutting, check for imperfections by running the back of your thumbnail along the side of the blade. You’ll be able to feels any nicks and know that it needs to get sharpened. To check the tension, hold the scissors parallel to the floor and lift the finger ring, then let it drop. If it drops immediately without any resistance, the tension is too loose. Tighten the screw at the joint until the finger ring can stay up by itself, and drops with just a light touch. And last, always dry your scissors off completely. Leaving water or hair product will cause them to rust over time. Whether beginner or professional, we hope this guide helped you learn a little more about professional hair cutting shears and got you further on the way toward your styling goals.